Do more recent Proposals indicate a move away from time costs? How are creditors voting now? How do time costs incurred compare to fees estimates? Are progress reports and excess fee requests compliant with the rules and SIP9? Is the picture any clearer now on what the regulators’ expectations are on some of the finer points of the rules and SIP9? Is there a move away from time costs? My analysis of Proposals issued in early 2016 (https://goo.gl/CYM0eD) showed that time costs was still the preferred choice: 75% of my sample (108 Proposals) had proposed fees based on time costs. This suggests that not a lot has changed, which isn’t too surprising I guess as there are only a few months’ difference between the two sets of Proposals. I also suspect that, if I looked at CVLs, I’d see quite a different picture. There does seem to be a bit more experimenting going on though, especially involving percentage fees, which is a topic I’ll come back to later. 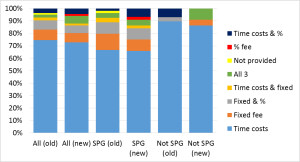 Although I accept that my sample is small, I think that this is interesting: the average reduction in fees approved is the same whether the decision was made by unsecured or secured creditors. I’d better explain the committee percentage: in these cases, the committees were approving fees only on the basis of time costs incurred, not on the estimated future time costs, which is also interesting: it isn’t what the fees rules envisaged, but I think it is how most committees are accustomed to vote on fees. Have creditors’ decisions changed more recently? Again, it’s only a small sample, but it seems to me that creditors’ enthusiasm to modify Proposals or cap fees has waned, although c.10% of Proposals were still modified, which is fairly substantial. 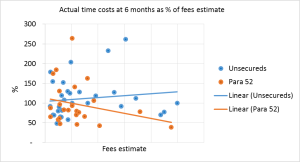 How have actual time costs compared to fees estimates? Over the whole case sample, the mean average was 105%, i.e. after only 6 months of the Administration, on average time costs were 105% of the fees estimate included in the Proposals. 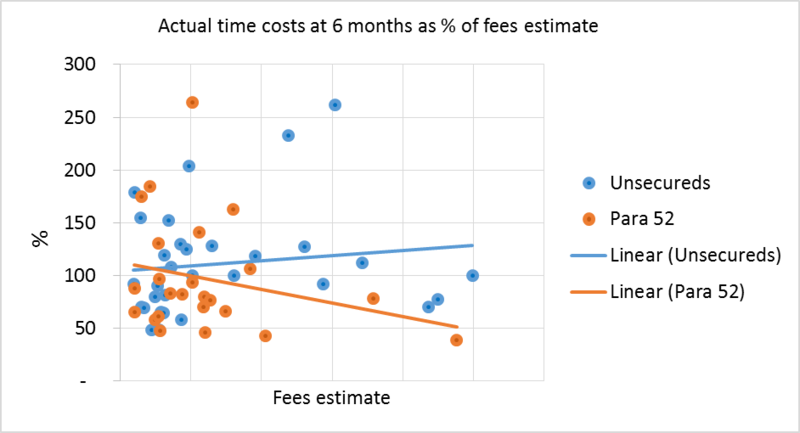 This graph also shows that, on a couple of cases, the time costs incurred at 6 months were over 250% of the fees estimate, although to be fair a large number were somewhere between 50% and 100%, which is where I’d expect it to be given that Administration work tends to be front-loaded. You can see that I’ve distinguished above between cases where unsecured creditors voted on the fees and the “para 52” cases where the secured (and possibly preferential) creditors voted. The graph appears to indicate that time costs exceeding the estimate is more marked in cases where unsecured creditors approve fees. Of course, fees estimates and fees drawn are entirely different worlds, so the fact that time costs have exceeded estimates will be of no practical consequence – at least, not to creditors – where a case has insufficient assets to support the work. In around only half of the cases where time costs exceeded estimates did the progress report disclose that the Administrator was, or would be, seeking approval to excess fees. This suggests that in the other half of all cases the IPs were prepared to do the work necessary without being paid for it, which I think is a message that many insolvency onlookers (and the Insolvency Service) don’t fully appreciate. How compliant are progress reports and excess fee requests? It is clear from the above that the old-style time costs breakdown alone will not be sufficient. For one thing, some automatically-produced old-style breakdowns do not provide the average charge-out rate per work category. I also think that simply including a copy of the original fee estimate “for comparison purposes” falls short as well, especially where the fees estimate uses different categories or descriptions from the time costs breakdown. What is required is some narrative to explain where more work was necessary than originally anticipated. The best examples I saw listed each work category (or at least those categories for which the time costs incurred exceeded the fees estimate) and gave case-specific explanations, such as that it had proven difficult to get the company records from the IT providers or that the initial investigations had revealed some questionable transactions that required further exploration. I also saw some useful and clear tables comparing the fee estimates and actual time costs per work category. As mentioned above, in some cases, the progress reports were accompanied by a request for additional fees and in these cases the comparison tables also factored in the future anticipated time costs and there was some clear narrative that distinguished between work done and future work. Reporting on expenses to meet the above requirements proved to be a challenge for some. Admittedly, the Rules are not ideal as they require fees estimates to provide “details of expenses” likely to be incurred and some IPs had interpreted this to require a description only of who would charge the expense and why, but it is only when you read the progress report requirements that you get the sense that the anticipated quantum of expenses was expected. For example, where an Administrators’ Proposals had stated simply that solicitors’ costs on a time costs basis were likely, it is not easy to produce a progress report that compares this with the actual costs or that states whether the actual expense had exceeded the details given previously. A year ago, the regulators seemed sympathetic to IPs grappling with the new Rules and SIP9. Do they consider that a year is sufficient for us all to have worked out how to do it? I get the sense that there may still be some forbearance when it comes to complying with every detail of the SIP, but understandably if there is a fundamental flaw in the way fees approval has been sought, it is not something on which the RPBs can – or indeed should – be light touch. Fees is Fees and the sooner we know our errors, the less disastrous it will be for us to fix them. The S98 Fees Estimate question seems to have crystallised. There seems to be general consensus now amongst the regulators and their monitoring teams that, whilst there are risks in relying on a fees resolution passed at the S98 meeting on the basis of fees-related documentation issued prior to appointment as a liquidator, the regulators will not treat such a fees resolution as invalid on this basis alone. Fortunately, the 2016 Rules will settle this debate once and for all. From my conversations with a few monitors and from the ICAEW Roadshow last year, I get the feeling that the monitors are generally comfortable with time cost resolutions. There is a logical science behind time costs as well as often voluminous paper-trails, so the monitors feel relatively well-equipped to review them and express a view on their reasonableness. The same cannot always be said about fees based on a percentage – or indeed on a fixed sum – basis. In her 2013 report, Professor Kempson expressed some doubts on the practicalities of percentage fees, observing that creditors could find it difficult to judge the reasonableness of a proposed percentage fee. When the Insolvency Service’s fees consultation was issued in 2014, R3 also remarked that fixed or percentage fees were not always compatible with unpredictable insolvencies and could result in unfair outcomes. The recent shift towards percentage fees, which appears more pronounced in CVLs, has put these concerns into the spot-light. In the ICAEW Roadshow, Allison Broad expressed her concerns about fees proposed on the basis of (often quite substantial) percentages of unknown or undisclosed assets. I can see Allison’s point: how can creditors make “an informed judgment about the reasonableness of an office holder’s request” if they have no information? Evidently, some IPs are proposing percentage fees as a kind of mopping-up strategy, so that they do not have to go to the expense of seeking creditors’ approval to fees later when they do have more information and they feel that creditors can take comfort in knowing that the IPs will not be drawing 100% of these later-materialised assets. Although a desire to avoid unnecessary costs is commendable, the message seems to be that compliance with SIP9 requires you to revert to creditors for fee-approval only when you can explain more clearly what work you intend to do and what financial benefit may be generated for creditors, e.g. what are the assets that you are pursuing or investigating. Another difficulty with percentage fees is the quantum at which they are sometimes pitched. I have heard some stories of extraordinary percentages proposed, although I do wonder if, taken in context, some of these are justifiable, e.g. where the percentage is to cover the statutory work as well as asset realisations. Regardless of this, the message seems to be that some of us could improve on meeting SIP9’s requirement “to explain why the basis requested is expected to produce a fair and reasonable reflection of the work that the office holder anticipates will be undertaken”… and you should not be lulled into a false sense of security that 15% of everything, which of course is what the OR can now draw with no justification (and indeed with no creditor approval), is always fair and reasonable. Although getting to grips with the Oct-15 Rules has not been easy, I guess we should count our blessings: at least we have had this past year to adapt to them before the whole world changes again. If there’s one thing we don’t want to get wrong, it is fee-approval, so at least we can face the April Rules changes feeling mildly confident that we have that one area sorted. If you would like to hear and see more on this topic (including some names of Administration cases that I found had particularly good progress reports and excess fee requests registered at Companies House), I have recorded an updated version of my R3 SPG Forum presentation, which is now available for Compliance Alliance subscribers. For more information, email info@thecompliancealliance.co.uk. Enter your email address to subscribe to this blog and receive notifications of new posts by email (you can unsubscribe by clicking on the link in our emails at any time). Please read our privacy notice (link below) before subscribing.